Autumn is my favorite time of year. I have planned my little gardens to transition from summer blooms to fall foliage. It's a work in progress. Below is a bed I put together last winter. 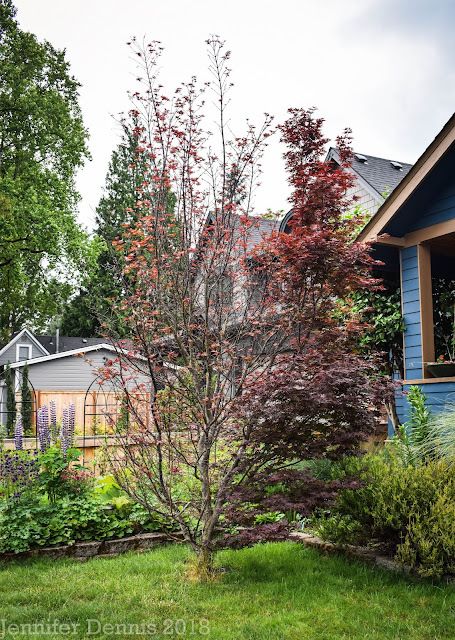 The coral bark maple tree had been planted there four years prior and is coming along nicely. It's beginning to show some pretty gold tones on the foliage. 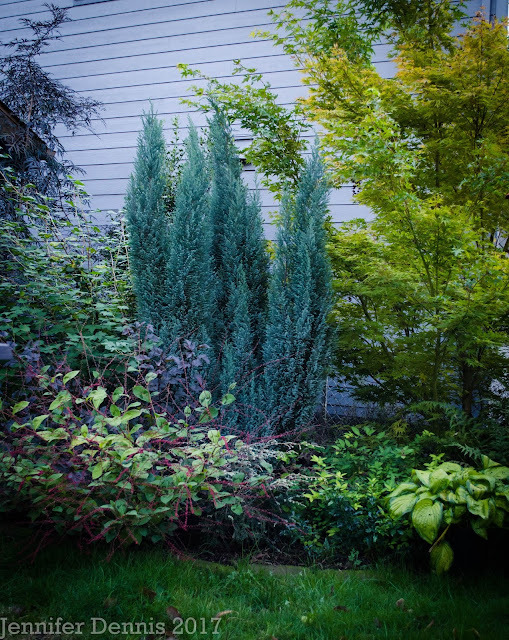 I like the contrast with the chamaecyparis lawsoniana 'Blue Surprise'. 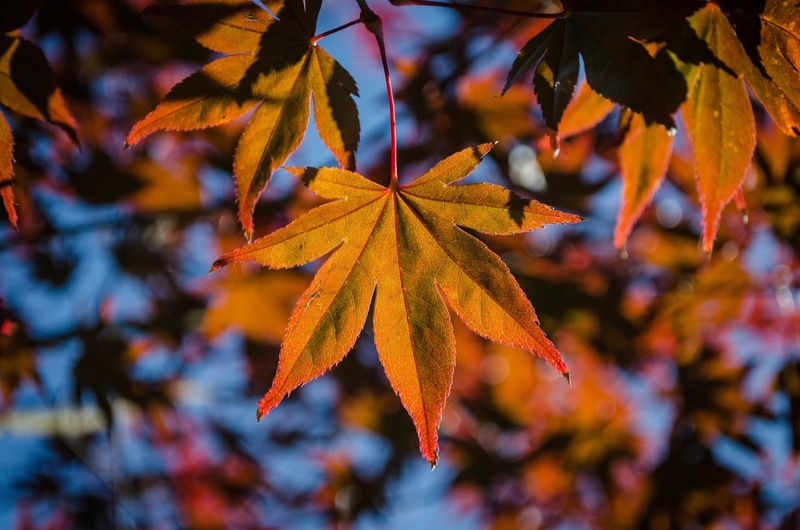 Oh, how I love the foliage on that pretty acer palmatum sango kaku or 'Coral Bark' maple. It turns into this bright gold and those contrasting coral colored stems..very lovely. Below is a closer look at one of the plants placed in front of the bed, Persica 'Lance Corporal'. Those tiny, coral red blooms have been a source of delight for me. I'm told the foliage will turn a bright gold color soon. 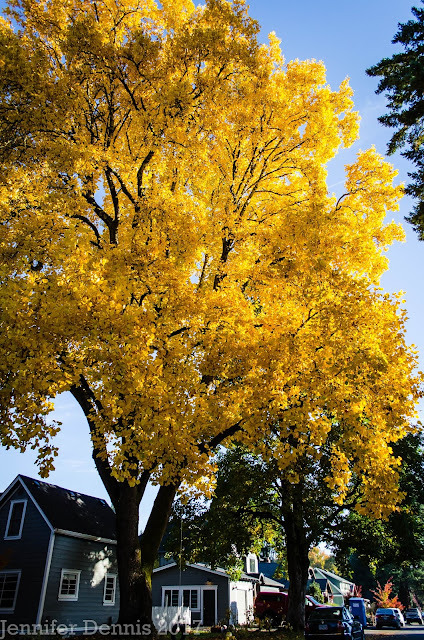 And speaking of gold...my neighbors Yellow Poplar is lighting up the neighbor like a torch. Isn't it pretty? I've never seen the tree fully gold in the six autumns we've spent here. The dry weather mixed with a few good rainstorms have provided the perfect weather mix for optimal fall foliage. 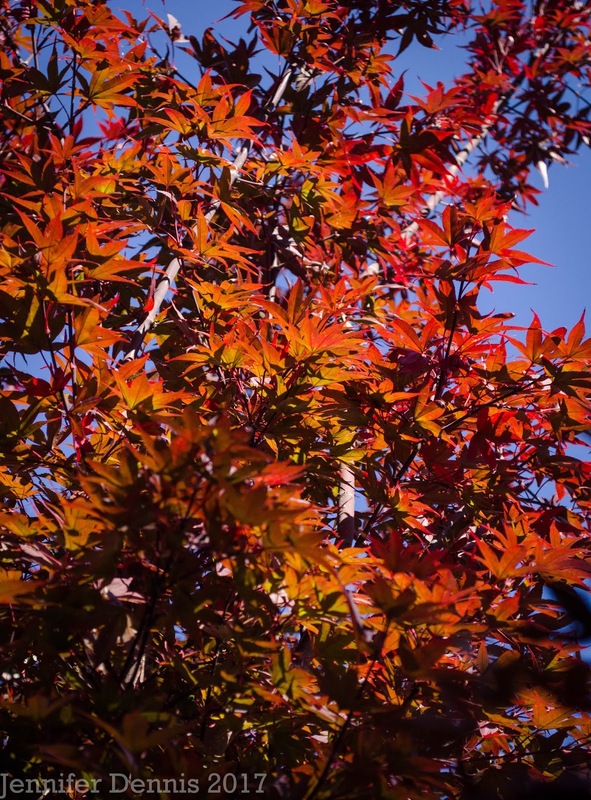 My favorite tree, in my own gardens, is my acer palmatum 'Fire Glow'. 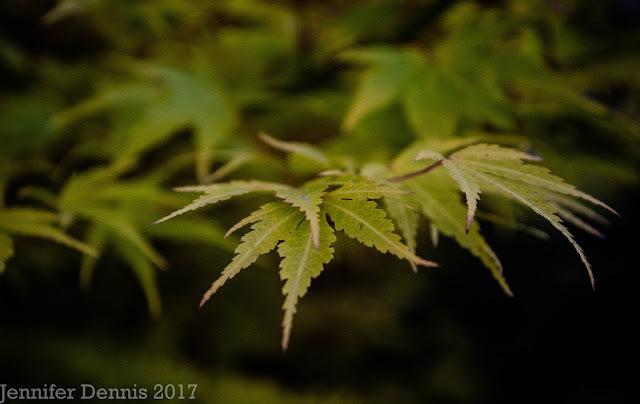 I could go on and on about this showy, little maple but I'll let the picture do the talking..
Yep. No filters on this pic..that's just how incredible it is to sit under this tree and gaze at the sky. In my front yard, the acer palmatum 'Twombly's Red Sentinel' is putting up a pretty show of red and orange colors under the sun. 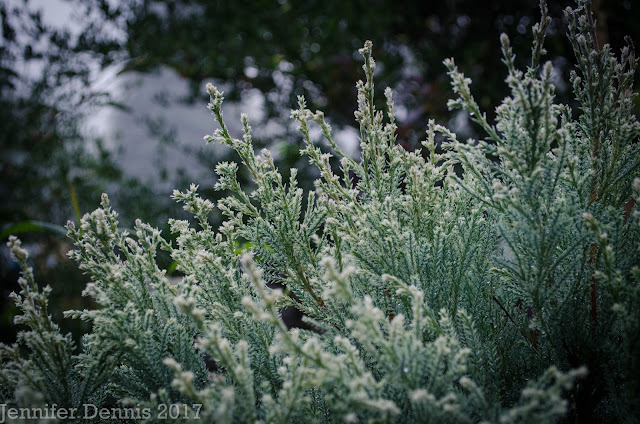 On the other end of the color spectrum...a foggy morning made this blue green shrub from Xera Nursery just pop! This is one of my favorite conifers. It's a selection of North American Eastern White Cedar. it's very compact and is considered a dwarf. The new growth has an icy blue-white color. Love love love!! 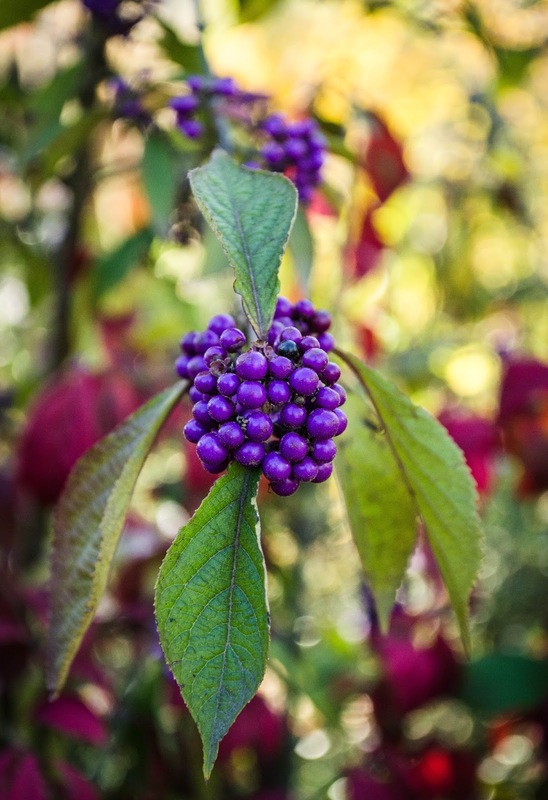 Next up..Callicarpa, or Beauty Berry is one of my favorites of the season. 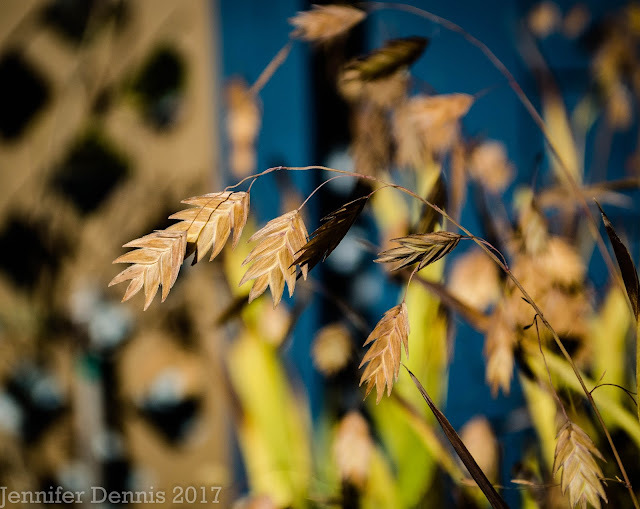 Grasses in autum show off their colors and pretty seed heads. I like panicums, miscanthus and calamagrostis..but I love chasmanthium latifolium in autumn. Northern Sea Oats have the most charming seed heads. 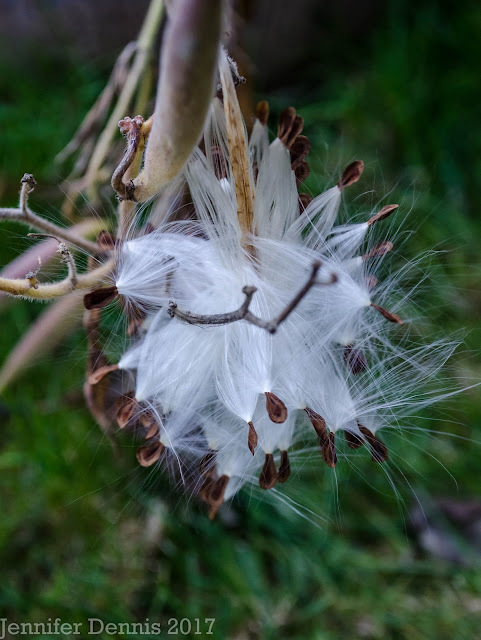 Continuing with the theme..seed pods opening from asclepias tuberosa 'Butteryfly Weed'. I look forward this event every year. 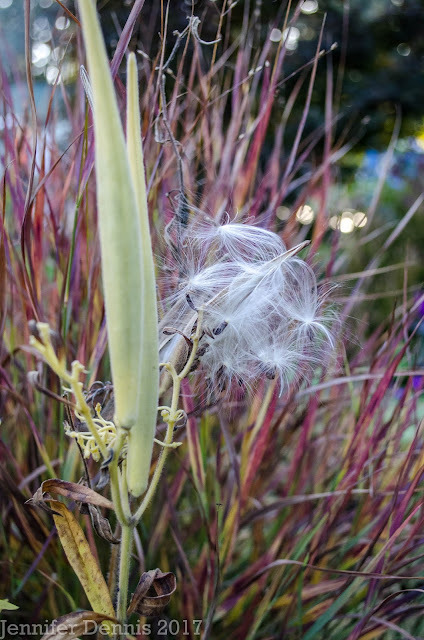 Then, they take flight on a gentle autumn breeze. Here they are ready to launch with a backdrop of panicum 'Shenandoah'. 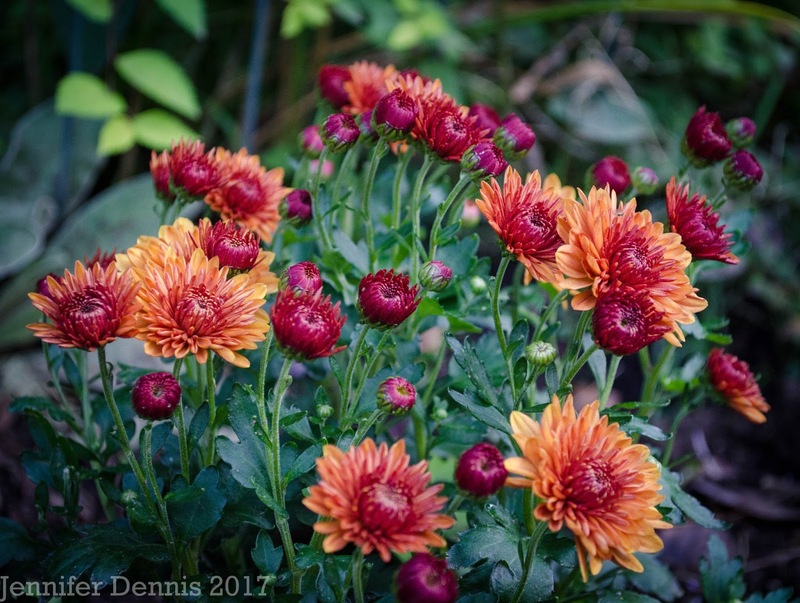 The mums and asters are blooming and Halloween is days away. 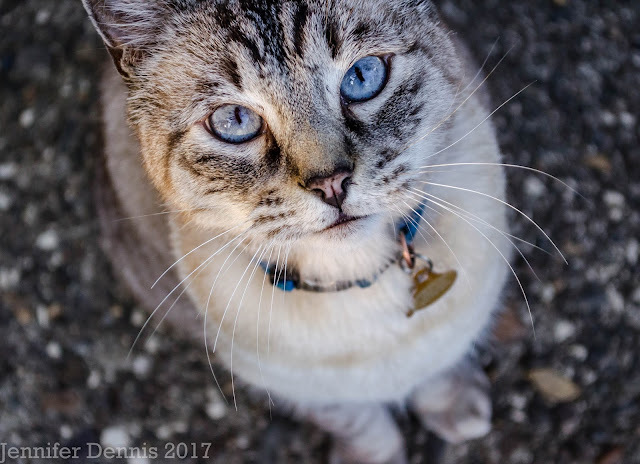 Silver cat and I have enjoyed our walks around the garden during these perfect fall days. We wish you a very happy Autumn season! 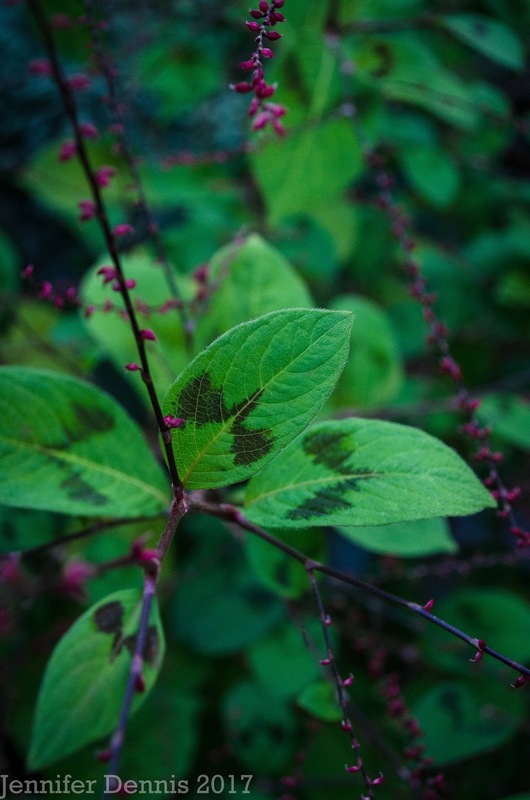 coming to terms with autumn" post today...and completely forgot to photograph my colorful blueberry plant...duh! Wonderful color! Your silver supervisor looks pretty stern. The yellow poplar and the hazel are striking. I also love the shapes of the Sea Oats. 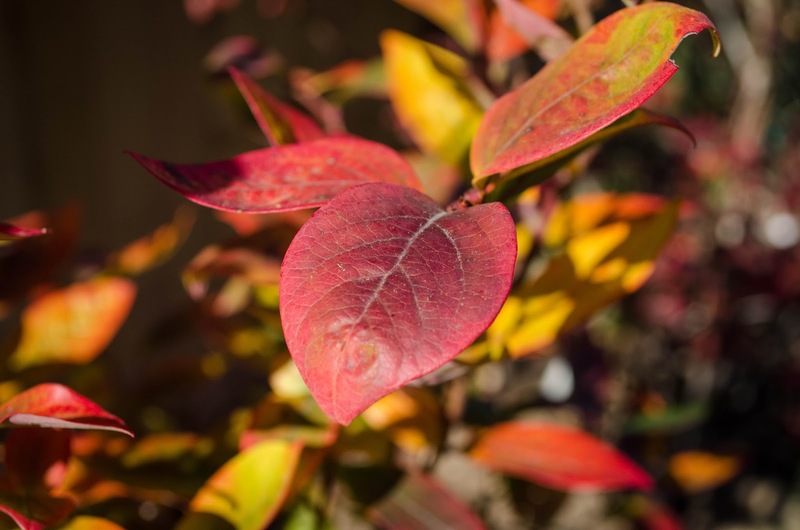 What beautiful fall photos, and I love your shrub and tree selection! I've never seen the Beauty Berry before - what stunning color! Such beautiful autumn colors, Jenni! Silver cat approves in an appropriately cat-like way. Hi Jennifer! You live in such a beautiful part of the world! 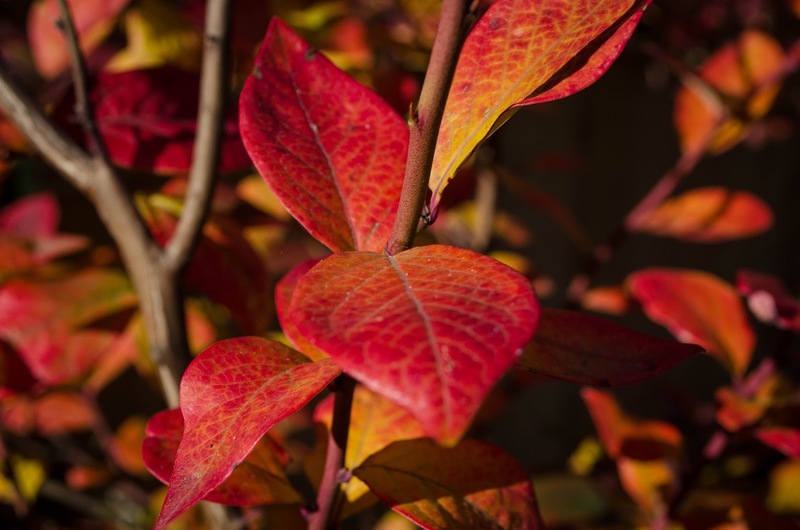 And, your garden plants look so healthy, even in the fall, and lovely! Love your photography!